Whether it is a big DIY (Do It Yourself) project, such as building a deck, or just a smaller project like installing a fixture, you need to have the right tools. One of the most important tools for these types of jobs is a drill. If you are looking for a drill that offers optimal torque and relentless power, AC-powered electric drills are the best options. However, this may not always be the right choice; their application is limited by the length of the extension cable. If you are looking for a solution that is more mobile, and still powerful to accomplish various drilling tasks, you should consider buying a cordless power drill. Before buying a cordless drill, consider the chuck size, voltage, battery type, drill speed, and hand grip before purchasing. To help you make the right choice, we reviewed 10 top-rated cordless drills today, in detail. 14 3. What About Brushless Drills? 15 4. How Much Torque Do I Need? 16 5. What is the Difference Between 20V Max and 20V Max XR? This Makita cordless power drill is rated the best for a reason. While some consumers may think of this product as expensive, it has more to offer for the price, as compared to other power drills within its price range. 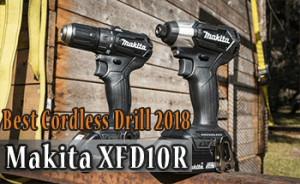 To begin with, the XFD10R delivers a decent amount of torque for a cordless drill. In this regard, the 4-pole motor used in this drill can produce about 480 in lbs of torque. Just like many other Makita products, the XFD10R features a transmission system, a 2-speed transmission system to be specific. As a result, the drill allows you to regulate the speed of your drill, in accordance with the 2 settings. The lower setting, for example, limits the bit speed to between 0 and 600 RPM. The upper setting, on the other hand, allows the drill to operate at a speed of between 0 and 1,900 RPM. Damage to power tools by water and or dust is something you need to be concerned about when buying these tools. However, this is not a problem for the XFD10R. The drill uses the innovative extreme protection technology (XPT) technology by the manufacturer to protect the device form damage by these elements. In addition to this protection, the drill also features an in-built dual-LED light. This light may be used to enhance visibility of the surface you are working on, if you are working under low light conditions. 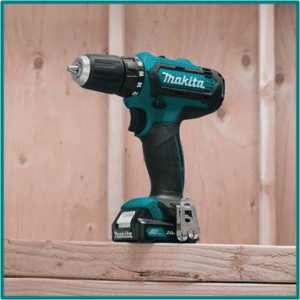 This Makita drill runs on an 18V Lithium-Ion battery and is compact in size, with a 1/2″ chunk. In addition to superior ergonomics, this product is designed to deliver optimal performance. As a matter of fact, this new model is about 25 percent faster than its predecessor. Again, low battery downtimes are reduced drastically with this model as it charges really fast. With this cordless drill, the manufacturer tried to curb operational fatigue for its users. As such, the XFD10R is lightweight and easy to control. Additionally, it features a rubberized soft grip. Weighing only 3.5 pounds, the DEWALT DCD790D2 cordless drill is, without a doubt, one of the most compact and lightweight cordless drills today. Additionally, its handles are positioned in such a way that the entire weight is well distributed in your hands. In addition to reducing operational fatigue, this allows for enhanced balance and control over the drill while working. The DCD790D2 is fitted with a 15 clutch setting. This makes the drill even more versatile as you can fine-tune the torque you would like the tool to produce, depending on the material you are working on. Running on a 20V lithium-ion battery, the DCD790D2 is a comparatively powerful cordless tool, capable of running at 2,000 RPM. However, the lowest clutch setting limits the speed of the drill to between 0 and 600 RPM. With regards to versatility, the DEWALT DCD790D2 may also be used as a screw driver. For this purpose, you will have to set its speed to the lowest setting. The upper speed setting on the drill is best suited for the more demanding tasks, such as drilling holes through wood. While most of the cordless power drills with the same power last less than 39 minutes on a fully-charged battery, the DCD790D2 can run for about 43 minutes on a fully-charged battery. The popularity of this cordless drill among users may be attributed to its variable clutch settings. This feature makes it possible for the drill to be used for various tasks, ranging from the lightweight repair tasks to the comparatively heavy-duty tasks. Are you looking for a cordless power drill that couples impressive performance with unparalleled durability? If so, you should consider buying the Bosch DDS182-02 cordless drill today. 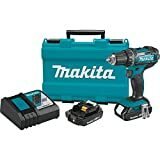 Packed with an 18V Lithium-ion battery, the drill charges fast and offer an impressive runtime (can last for up to 54 minutes on a fully-charged battery). The comparatively long runtime offered by the DDS182-02 may be attributed to the 20 clutch setting, along with the high-capacity battery. In this regard, the cordless drill can operate at a maximum speed of 1,700 RPM and produce about 442 in-lb of torque. Although its speed is relatively low, the Bosch DDS182-02 drill is renowned for its impressive performance and durability. It is also one of the most versatile tools in this review because it couples as a screwdriver, when operated at the low-speed setting. The 20 clutch setting may not be much for some users, but it is adequate for most DIY projects you may be interested in. This feature allows you to control the torque produced by your cordless drill, hence avoid snapping off the fastener heads or over drilling the material you are working on. As a result, this variable clutch setting makes it easier to control your drill. Similar to the cordless drills reviewed above, the DDS182-02 features an impressive ergonomic design. The precise handling and control associated with this drill is as result of the proper distribution of weight and heft below as well as above the grip. You can also use the too under low light conditions, thanks to the in-built LED light that illuminates the material you are working on. Bosch, the manufacturer of this cordless drill stands behind its products as a guarantee of quality and performance. The DCD790D2 is no exception; the company offers a one-year warranty on this power drill. The warranty covers any defects resulting from the materials used to make the drill or poor workmanship. As such, you can rest assured that you are buying a quality product. If you are looking for a powerful cordless, do-it-all drill for any commercial application, the 2703-22 M18 by Milwaukee is one of the best you can buy today. The drill is fitted with a powerful brushless motor that is capable of producing 725 in-lbs of torque. The fact that the motor is brushless implies that the drill runs at optimal performance and can last for a long period. 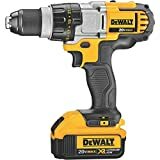 A power drill this powerful can actually carry out almost any task, including the comparatively heavy-duty commercial tasks. This product has also benefited from the innovative REDLINK PLUS technology by the manufacturer. This technology is aimed at improving efficiency of the unit. To achieve this, the technology facilitates an efficient transfer of energy between the charger, battery and the drill itself. This being the case, it is very unlikely for this drill to get overworked, which extends its durability. The M18 features a compact and lightweight ergonomic design, featuring a 1/2 “chuck. This contributes to a commendable weight distribution on the handle of the Milwaukee 2703-22 M18. As a result, it is one of the best commercial cordless drills out there, with regards to ease of handling. You will also love the fact that the unit comes with two M18 REDLITHIUM™ XC batteries. This is in a bit to reduce downtimes and maximise its running life. It is comparatively costly, as compared to other drills within its category. However, the price is justified by its features and a generous 5-year warranty. The Rockwell RK2852K2 combines long battery life with efficiency and convenience. Such aspects make it one of the most preferred cordless drills today. With regards to ease of use, the drill is fitted with a keyless ½” chunk. As a result, you can use either the hex or round shank drilling bits on the RK2852K2. Additionally, the chunk on this drill is a single sleeve ratcheting type of chunk. This being the case, it offers a tough and firm grip that is meant to reduce slippage or even accidents while you are using the drill. Want to work extra hours, but do not have lights in your workshop? The RK2852K2 has an inbuilt LED light that will illuminate the material you are drilling. 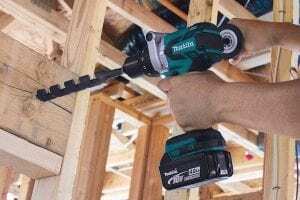 When it comes to performance, this is one of the best performing cordless drills in this guide. Featuring a multiple torque setting, the Rockwell RK2852K2 cordless drill can produce up to 531 in-lbs of torque and operate at speeds of up to 2,000 RPM. The motor and battery in a cordless drill are other components that saw the RK2852K2 included in this guide. 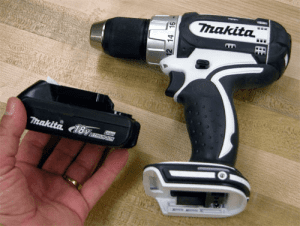 The battery is actually one of the things that set this drill apart from its competitors; it comes with Free-Batteries-for-Life warranty batteries. This is to say that the manufacturer will gladly replace the battery in your RK2852K2 for free, if it becomes weak, fails to function as expected, or dies. If the battery in your unit is not functioning as it should, you should just call the manufacturer and it will be replaced for free, regardless of how many times it has been replaced before. Additionally, the manufacturer also offers a 10-year warranty on the motor. Such offers are just a guarantee that you are getting nothing short of the best quality when you buy this drill. The 20 V batteries, along with the brushless motor fitted on this tool offer a seamless performance and are very durable. The gear selector on the drill is relatively hard to operate. Gone are the days when brushless motors were only used in high-end cordless drills. Currently, the leading manufactures are using this innovative technology to produce some of the most efficient, long-lasting and durable, yet affordable cordless power drills. 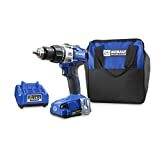 If you are looking for a high quality drill that is priced below $200, but offers features initially found in high-end power drills, the Kobalt 1424A-03 is a great choice. Since the Kobalt manufacturer first unveiled the first cordless drill, back in 2012, it has been striving to produce some of the most efficient, compact and functional products. As compared to the Kobalt 20V model, the new Kobalt 24V is shorter by an inch. Additionally, the new model features brushless technology, which has resulted in an increase in torque by about 25 percent. 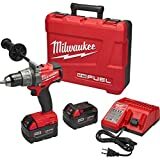 This actually sets this cordless drill form its competition; it is actually one of the most powerful cordless drills within this price range today. The current model can produce about 550 in-lbs of torque and operate at a maximum speed of 2,000 RPMs. Such a performance is rare within this price range. The drill features a 4-LED indicator that shows you the battery level when you are charging the battery. This way, you can tell once the battery in your 1424A-03 drill is fully charged. The manufacturer used a 1/2-inch chuck. The all-metal, chuck ratchets well and snugs on the bit shanks securely. Are you looking for the best cordless drill, but are working on a limited budget? Do not let money constraints bar you from getting a high quality product; you can buy the Ryobi P1811 for less than $150 and still get the features you need. Do not let the price fool you; this is a really powerful drill, capable that can deliver 340 inch-pounds of torque. With regards to the operational speed, this Ryobi drill is fitted with a 2-transmission system. The low speed setting restricts the device to a speed of between 0 and 440 RPM, while the high speed setting allows the drill to operate at speeds of up to 1,600 RPM. This is commendable for a cordless drill priced below $150, don’t you think? Under its low speed setting, the P1811 Ryobi drill may also be used as a screwdriver. In addition to the selective speeds, this drill also allows you to choose between 23 clutch settings. Again, these are many clutch settings for an affordable cordless drill. With such a high number of clutch settings to choose from, you can imagine how easy it is to control the torque produced by the Ryobi P1811 tool. However, the maximum torque produced by this tool is relatively low. This implies that the P1811 may only be used for lightweight drilling tasks. As opposed to the other cordless drills reviewed in this guide, the P1811 can use both lithium-ion and nickel-cadmium batteries. In an effort to reduce downtimes, the product comes with two batteries. As such, you can leave one charging as you use the other one in your drill. Based on various test results, the P1811 can run for about 45 minutes on a fully-charged battery. The 340 inch-pound torque produced by the drill is relatively low, especially for heavy-duty tasks. Well, everything about this cordless power drill is just fascinating, other than the fact that it does not have a gauge to tell you the battery level. For instance, the product comes with two 3.0 Ah 20V Max batteries to curb downtimes. Such batteries work very well with the comparatively powerful motor to deliver 350 watts of torque. As for the speed, the drill is equipped with a highly effective 3-speed metal transmission system. As such, you can regulate the speed of your cordless drill, depending on the material you are working on or the scope of the task you are trying to accomplish with your drill. In this case, the low speed level limits the speeds to between 0 and 575 RPM, the middle speed level restricts the speed of the drill to between 0 and 1,350 RPM, while the high speed level allows the drill to operate at speeds of up to 2,000RPM. Additionally, the drill also features a variable clutch setting that offers 22 settings. As such, you are not only able to regulate the speed; you can also regulate the amount of torque produced by this power drill. As you can see, the DCD980L2 offers features similar to those offered by the comparatively expensive cordless drills in the market today. Featuring a ½ “ ratcheting chuck, this drill is a true business-end tool. This chuck is both solid and easy to secure in place. Another convenience feature you will love about this tool is the bright LED light. You may use this to enhance visibility when using your drill on low-light conditions. 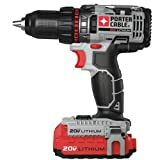 The PORTER-CABLE PCCK600LB drill uses the latest lithium-ion battery technology by the manufacturer to power a lightweight and efficient cordless drill. On the outside, this drill is designed to be compact and lightweight. This is in an effort to reduce operational fatigue on the part of the user. To further enhance its performance, the drill is equipped with a 2-speed transmission, with a maximum speed of 1,600 RPM. It is this variable speed and torque that makes the tool ideal for an array of tasks. Another fascinating feature you will love about this drill is the battery itself. The PCCK600LB uses the recent innovative lithium-ion battery platform by the manufacturer. As a result, the unit delivers long-lasting power. This being the case, you can concentrate on finishing your task, rather than worrying about when the battery may give in. As mentioned earlier, a cordless drill is just as good as its battery. In this regard, the PORTER-CABLE PCCK600LB cordless drill is a reliable tool. What about the design? Although this is one of the cheapest cordless drills you can buy today, it is packed with an array of convenience and functional features. For instance, the drill features a lightweight (about 3.5 pounds), ergonomic design. This makes it easy to handle and control. Again, the tool was specifically designed to fit into small spaces, such as crannies and nooks, where drilling is needed. Cordless drills are all about portability and power. In this regard, you must be looking for a unit that is compact and lightweight, yet powerful enough to accomplish any drilling task. Well, the Hitachi DS18DSAL is one such a tool. As a matter of fact, this is one of the best 18-volt ductless drills today. One of the striking aspects of this drill is its outer design. It features a soft, easy to grip handle that distributes the entire weight evenly on the handle. This coupled with the lightweight nature of the product make it easy to handle. When it comes to power, the DS18DSAL does not disappoint either. 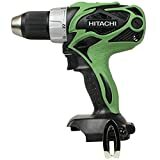 Although it is a small and easy to handle drill, it delivers an impressive amount of power, up to 460 in-lbs of torque. Additionally, it is easy to carry around; it comes with a case and loop case that you can use to carry the drill around. As for the battery, the drill will give you mixed reactions. While the battery charges really fast, it does not retain charge for a long time. However, you will love the battery level gauge fitted at the base of the charger. This accurate gauge will let you know the battery level at any given time. When working in low light conditions, such as when drilling a hole in your attic, the LED light built into this drill will come in handy. As such, you will not need a torch or bulb in such a condition; just switch on the bright LED light on your Hitachi DS18DSAL and get to work. Buying a cordless power drill is going to cost you a considerable amount of money. As such, it is not advisable to rush while shopping for one. Instead, you should take time to compare the available makes and models, based on the various aspects discussed below, before making your final pick. Most of the experts in the industry will tell you that you should buy a unit that is powerful and has a reliable battery. Sure, it should be powerful, but how powerful should your drill be? Just as is the case with any other power tool, cost is a key consideration. However, you do not want to end up buying a powerful unit that is too expensive or a cheap one that does not meet your needs. As such, the right cordless power drill for your needs is a rather relative subject. Basically, drills under different price ranges have varying features and specs that affect the performance of the drills in several ways. 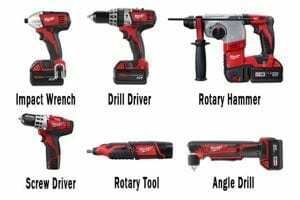 If you are shopping for the right drill, you first need to learn the various terms used to describe their capabilities. For the cordless power drills, the chunk is the clamp that is used to secure the rotating bit in place. The size of this component will determine the size of bits that may be used on your preferred drill choice. While the commonest chunk sizes are only 3/8 inch and 1/2 inch, your choice should be influenced by the intended use of the drill. For instance, the 3/8 inch chunk size is best suited for heavy duty work. Power in cordless power drills is measured in Volts and most drills today have a rating of between 2 Volts and 24 Volts. While higher voltage means more power to overcome resistance, it is also associated with increased weight. For instance, most 12-Volt drills weigh about 3.5 pounds while some 24-volt drills weigh between 7 and 10 pounds. The type of battery in your preferred drill is an important consideration because any cordless power drill is just as good as its battery. Most of these appliances today come with either lithium ion or nickel cadmium batteries. The Nickel cadmium type of batteries is considered to be more long-lasting, durable and comparatively inexpensive. In this regard, some nickel cadmium batteries that come with cordless drills may be charged more than 1,000 times before they are replaced. However, these batteries need to be recharged more frequently. While this is the case, the Lithium ion batteries are the preferred option for cordless drills today. This may be attributed to the fact that these batteries have a hire energy density and are comparatively lighter. However the Lithium ion batteries are comparatively expensive. Regardless of your battery choice, it is advisable to buy a second battery pack. This way, you will have one charging while you are using the other one on the drill. The speed of any drill is expressed as the number of revolutions it can achieve in a minute (RPM). Most of the cheaper cordless drill options operate at a single speed, which is mostly about 300 RPM. Such drills are suitable for light tasks, such as screwing in nails. The more expensive cordless drill options have a speed of between 1,200 and 1,500 RPM. Some of the high-end cordless drills also offer variable control, which allows you to alter the speed of the bit on your drill. This is the component that will disengage the drive shaft on your drill, if the drill reaches a certain resistance. When engaging, the cutch usually produces a clicking sound. The main function of the clutch in a cordless drill is to prevent the motor from overworking. To achieve this, the clutch turns the screwdriver bit off when the desired resistance is reached. While this is a standard feature in many drills today, the type of clutch setting offered by different drill models may vary. For instance, the more expensive drills offer up to 24 different clutch settings. Such settings come in handy when customizing the drill to the material you are working on. In this regard, lower clutch settings are ideal for small screws while more settings are suited for larger threads. However, you do not need the clutch settings when carrying out simpler basic repair tasks. For a better grip and enhanced control over your power drill, it is advisable to buy a drill that features a soft grip as well as an ergonomic design. 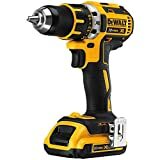 A cordless power drill that has a soft grip, T-handle design, for example, will offer you better control and enhanced balance whenever you are using the drill. Apart from the standard features described above, other cordless drill models offer additional features, which are mostly meant to set them apart. For instance, there are some that have more than one handles for easier handling and enhanced precision. Other cordless power drills today have built-in-LED lights to help you see dark and tight spaces. You can also find a model that features rotating handles. Such a drill allows you to find the angle you want to work with. Another feature you should consider for these power tools is an electronic brake. Normally, the drill should wind down slowly once you have released the trigger. With electronic brakes, the bit will stop as soon as you release the trigger. In addition to giving you optimal control to the drill, electronic brakes on cordless drills also prevent stripping. These add a pounding action to the operation of a regular drill. This is ideal for drilling holes as a mason. This added force comes in handy when using your drill to make holes in cement or to install dense fixtures like an electrical box. In this regard, these drills often have a switch that allows you to engage and disengage the hummer clutch on your drill at any given time. These are designed to offer more torque in a direction perpendicular to the bit than conventional cordless drills. As such, you do not have to apply much pressure to the drill so as to accomplish the desired task. Impact drivers are mostly used on heavy-duty tasks, such as loosening lug nuts and large bolts. However, these drills are comparatively loud and require special hexagonal shanks. If you are looking for a drill to use entirely on light tasks, such as screwing light-weight furniture together or drilling nails, you should consider buying a cordless screwdriver. Most of the cordless screwdrivers today are compact in size and lightweight. As a matter of fact, most of them weigh only a pound and can fit into your pockets. 3. What About Brushless Drills? Most drills allow a specific amount of power to be exerted by the motor. However, when your drill is brushless, the motor senses the tension on the bit. Then, the motor adjusts the amount of power it sends based on that tension. This is an incredible feature on your drill. If you are using your drill for many different purposes, choosing a brushless drill is a fantastic option. One of the best pieces about a brushless drill is that this ultimately saves battery power. If the drill senses less tension than normal, then less of the battery is used. If the drill senses more tension, more of the battery is used, but you are given more power. 4. How Much Torque Do I Need? If you are purchasing a drill for standard around the home activity, torque should not matter. Even a “cheap” drill will be able to tights screws or create small holes. However, the real need for high torque power comes when you will be drilling holes or screws into metal. Keep in mind, the best drills come with a dial for their torque to change. In other words, if you are occasionally working with metal in your drilling, you will want to purchase a drill with a variable torque. This allows you to set the torque so that you can decide how much torque you need. Remember, if the speed is high on the drill, you will probably not have as much torque. If you are truly looking for a heavy-duty drill to do tough metal work, look for a low-speed rating and high torque. The best speed rating for your drill is going to be between 300 and 1200. Again, if you are working on heavy-duty projects, stick to the 300-500 speed range. Otherwise, a higher speed drill will be best. 5. What is the Difference Between 20V Max and 20V Max XR? 20V Max and 20V Max XR refer to a type of battery. A 20V Max battery has 1.5 Amps to it, while a 20V Max XR has 3.0 Amps to it. These are standard sized batteries that can both be used in the same drill. The 20V Max XR batteries will last longer than a 20V Max. Additionally, if you use the batteries with a drill without a brush, then the battery will also be able to exert more power to drill, etc. While we recommend the 20V Max XR battery, either battery will allow you to use your drill sufficiently. However, any battery with a higher amperage will allow you to work longer. You will also want a holster on you when you are using a drill. A holster allows you to keep your drill within an arm’s reach at any time. If you are not wearing a holster and you get your objects in position and realize you have no drill, this can be a colossal waste of time. Save your time and energy and use a drill holster. This is a tough one to take note of. Most drills take several hours to charge fully. This means you need to be aware of the amount of time needed by your charger and allow your battery to sit there long enough. If you take the battery off too soon, you won’t have sufficient charge for your project. Conversely, be aware of whether or not your charger allows over-charging. Over-charging occurs when your charger continues to charge the battery even after it is fully charged. Over-charging can actually ruin your battery. It can simply shorten the battery’s life over time or, if you leave the battery on for far too long, it can cause significant damage to the battery. Our last tip for the best cordless drill experience is to consider purchasing an entire drill kit. These kits come with a case for your drill. They also come with a set number of drill bits, which is important to have so that you can work on various projects. Finally, a drill kit normally comes with two batteries for the drill and a charger. This last piece is important, as often a battery will die out on you. If this happens, then you know you have a back-up. If a battery does die out on you, remember to look online to find out where you should take your battery. Most batteries need to be taken to a hardware store or a recycling depot so that they can be properly disposed of. These kits come with each piece that you need to immediately use your drill. You should be able to use your drill within a few hours of arriving home. Additionally, you won’t have to make return trips for different sized bits. Whether you are just making some cosmetic changes to your apartment, home or office or are building a structure from scratch, you are going to need a drill. However, choosing the right one for your needs can be a bit challenging, especially if you are not well informed. With the considerations discussed in this guide, it should be easy for you to choose the right cordless power drill. 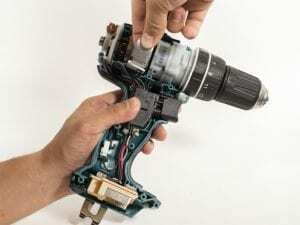 In this regard, a drill that has limited additional features and delivers modest power is best suited for lightweight household tasks, such as basic repair tasks. If you are still confused about which unit to buy, leave us a comment below and we will help you find the best cordless drill for you.